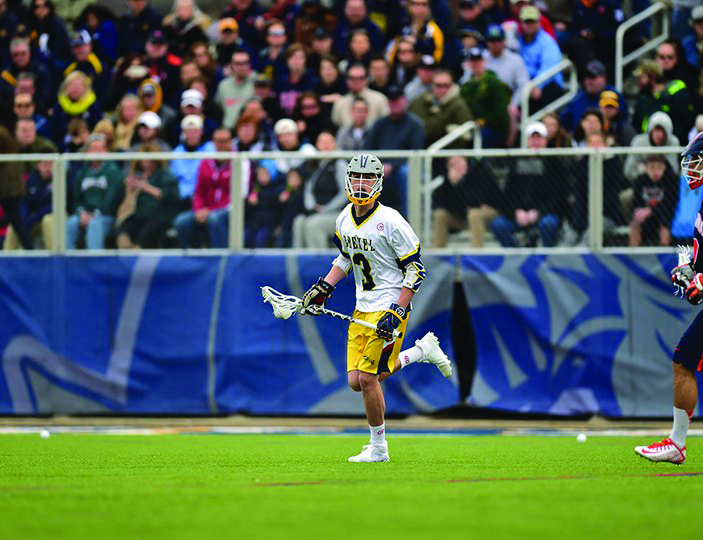 The Drexel University men’s lacrosse team took a 14-8 to the University of Massachusetts Amherst Minutemen in their final Colonial Athletic Association game before the CAA tournament. A The winners of each semifinal match will move on to the championship game May 6. The Minutemen goalkeeper had 15 saves while Drexel senior Jimmy Joe Granito had only seven. The leading scorer for the Minutemen was Jesse Leung who managed to net five goals. The first quarter gave the impression of a good matchup for both teams. Drexel’s junior Jake O’Donnell had the first goal of the game on a man-up play with an assist from sophomore Marshal King. Two minutes later, the Minutemen scored to tie. The Dragons scored back to back goals within less than two minutes of each other. The first goal was netted by freshman Reid Bowering, the second from senior Robert Frazee. This was Bowering’s 24th goal of the season and Frazee’s 22nd. They are currently the second and third top scorers for the Dragons this season, respectively. With 2:25 left to play, the Minutemen scored the last goal of the opening quarter to bring their score within one goal of the Dragons. Less than two minutes into the second quarter after losing the faceoff, the Minutemen came back with a goal to tie the game 3-3. Senior Cole Shafer quickly responded with a man-up goal assisted by Marshal King with 10:53 left to play in the period. This quarter continued to go back and forth until the final 5:39 of the quarter. Marshal King scored his tenth goal of the season, but just ten seconds later the Minutemen responded to tie the game again. With the score knotted 5-5, the Minutemen went on a run to score three more goals to give them a three-point lead heading into the third quarter. The Minutemen won the faceoff to open the third quarter, but neither team could score until UMass’s Devin Spencer scored his first goal of the season with 9:09 left to play in the period. The Minutemen would continue a 7-0 scoring run from the second quarter to lead 11-5 heading into the last quarter. Drexel won the faceoff for the last quarter, but a turnover caused by Minuteman Jake Marino quickly gave UMass the ball again. The Minutemen scored not even a minute into the quarter to increase their lead to 12-5. However, it was time for Drexel to respond. Ending an 8-0 scoring run by the Minutemen, the Dragons had their own 3-0 scoring run to try to make a comeback. Robert Frazee netted his second goal of the game with 12:40 left to play. He was followed by senior Jeremy Omrod and sophomore Chris Friedman for their third and seconds goals of the season, respectively. Sadly, Friedman’s goal would be the last goal for the Dragons against the Minutemen. UMass scored two more times before the conclusion of the game to win 14-8. Both teams continued to the CAA championships starting with the semifinal games Thursday, May 4. The Dragons traveled to Maryland where they played the No. 1-seeded Towson University Tigers. At the beginning of April, the Dragons played Towson and lost 8-7. Towson just won against Hofstra University April 29. Towson won the opening faceoff and drove to the net for the first goal of the game. During the next eight minutes of play, the Dragons and Tigers exchanged shots on goal. With 5:05 left to play, Marshal King scored his 11th goal of the season to bring the score tied 1-1. Both teams entered the second quarter hungry to break the tie and take control of this semifinals matchup. Sophomore Cam Harris had his second goal of the season to give the Dragons the lead. With 10:40 left to play in the second quarter, the Tigers began a 3-0 scoring run against the Dragons. Jimmy Joe Granito had six saves during this quarter to lead the defense against the Tigers, but Towson led 4-2 heading into the third quarter. The opening three minutes of the third quarter began with two more goals from the Tigers to increase their scoring run to 5-0 against the Dragons. Marshal King responded for the Dragons with a goal at 6:41 off an assist from junior Will Manganiello. The Tigers were not ready to give the Dragons another goal. With 52 seconds left to play in the third, the Tigers scored to lead 7-3 heading into the last quarter. Neither team was able to score until the final 2:30 to play. Although the last goal of the game came from senior Cole Shafer, the Tigers won 8-4 to clinch their spot in the CAA championship finals. Senior Jimmy Joe Granito was named to the First Team All-CAA for 2017, and his 18 saves against Towson proves why. This was a record number of saves in a CAA tournament game for a Drexel Dragon. Although the Tigers held off the Dragons’ offense, the defense was definitely led by Granito who has continued to be a tremendous leader throughout the season. Senior Cole Shafer had his 119th goal of his career during this game. This leaves him in sixth place overall in Drexel’s record book. He scored a total of 35 goals this season to lead the Dragons in goals and points. This puts him in the top 10 in the CAA conference for number of goals, points, shots, and man-up goals per game for this season. Following behind Shafer in goals for the season was freshman Reid Bowering, who also appeared in the top 10 in the CAA for goals, assists, points, and man-up goals per game. More than half of the Dragons’ roster this season scored at least one goal. The Dragons ended their season 6-8 overall.